The Cleveland area is a great place to live. Are you surprised to hear that? Well, it is! There is something for everyone here: great museums, botanical gardens, sports teams, schools, hospitals, Lake Erie, an International airport, the Playhouse, Orchestra, The Rock & Roll Hall of Fame, Great Lakes Science Center, University Circle, and, generally, nice people. Something not thought of much today, and taken for granted by those who live here, is the abundance of fresh water and temperate climate. Aside from a winter that is a little longer than desired by most, we have wonderful seasons, and there is little or no threat from earthquakes, volcanoes, hurricanes, or other severe weather or seismic activity that other parts of the country enjoy. Surprisingly, the cost of living in the Cleveland area is very low. I predict that, as fresh water and more severe weather become more problematic in other parts of the country, this area will become much more desirable. So, I have concluded that Cleveland and northeast Ohio get a bad rap, and I'm going to use The Itch to help change that. 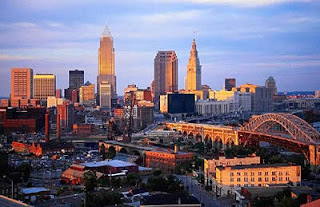 Starting with this post, I will occasionally write something interesting or wonderful about the Cleveland area, and will call these feature posts Highlight Cleveland. It's not very original (I'm open to suggestions), but makes the point. Today I'm going to write a little about the Westside Market. 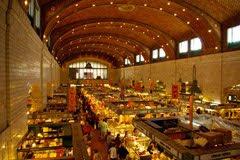 Located at the intersection of West 25th Street and Lorain Road, the Market is a Cleveland landmark. Inside the building, easily recognizable by the large clock-tower on the west side of the building, are vendors selling unique food items including produce, meat, seafood, baked goods, nuts, coffee, herbs, pasta, cheese, and candy. Many of the vendors sell items that are hard to find or have an ethnic flair. There is a stand that sells Irish food, a Hungarian butcher, Middle Eastern spices, Mexican food, pierogies, and fresh meat. It is the only place I know where you can easily find a pig with the head still attached! Most are independent and locally owned businesses. The market was opened in 1840, when what is now Cleveland was Ohio City. 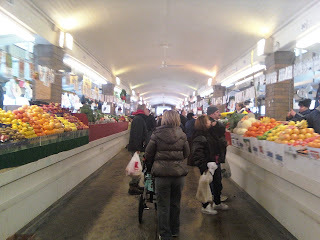 It is Cleveland's oldest public market. It underwent several renovations and improvements over the years, and the current building was constructed in 1912, and in 1915 the tenants organization was formed, and is responsible for the improvements made since then, including major renovations in 1953 and again the the 1970's. The Market is also a part of Cleveland's west-side community. There are festivals, and it is a popular spot for politicians to stop to meet and greet locals and sample the local flavor. I have been aware of the Market for most of my life, but didn't experience my first visit until about ten years ago. A friend from work is a regular there since childhood, and he took me for the first time. It is a remarkable structure, with a high, arched ceiling, tile floor, and stand after stand of unique foods. The produce area has many vendors with hard to find fruits and vegetables. The prices, and quality, vary, and haggling for the best price is commonplace. Every time I visit the Market, I feel as if I have stepped back in time. I think of people of years past relying on the market for all their grocery needs. Most of them likely lived in the area and walked there, with their handcarts, and went several times each week. On the west side of the building there is a balcony that looks over the entire indoor market. It became a tradition for me to buy a bratwurst sandwich and eat while sitting on the balcony, looking over the crowd. I hope the Market continues to thrive, so I can enjoy the bratwurst for many years to come. Excellent! I Look forward to hearing more good things about the North Coast!